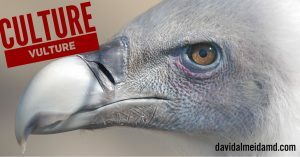 TASK AT HAND: This week I’m thinking about what it means to be a culture vulture. This is a term that I have comes to admire with great esteem! I was born in Portugal, grew up in Canada, did a PhD in Hungary, an MD in Canada, and an MBA in the USA. I did my vitreoretinal surgery fellowship in Iowa and now I am proud to be part of VitreoRetinal Surgery, PA and call Minneapolis-St Paul, Minnesota my home. Throughout this extended journey, I have had the privilege of experiencing different cultural mores and philosophies. Some that I like and some that I don’t. Parts which I emulate and others I prefer to distance myself from. This has been a wonderful and expanding learning experience allowing me appreciation of cultural breadth. Needless to say, over the years, I have enjoyed being a culture vulture! Within the Urban Dictionary, one of the definitions of a Culture Vulture is “a person who loves art, music, movies, and dance, and all forms of culture so much that they consume whatever they find.” The consumption of culture is a bona fide way to open yourself to a myriad of experiences. Now, there is one issue that we must note; the mass consumption of culture can be confusing if you curate without context. While I have no issue with exposure to all forms of art or culture – both good and bad – you still need to be cognizant of that which you are incorporating into your practices. A degree of discernment, a slice of skepticism, query and questioning always need to be present. As we close out the month of July, here in the western hemisphere, we find ourselves in the depths of summer. In this season of sun and adventure, I encourage you to enjoy the rest of the summer and be a culture vulture! Go out experience a wide range of contexts. Curate experiences outside your comfort zones. Take bites of the extensive palette in front of you. MEDICINE & MACULA: A special thanks to Dr Parnian Arjmand MD, a senior ophthalmology resident from the University of Ottawa (Ottawa, Ontario, Canada). 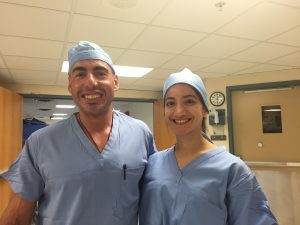 She visited us here at VitreoRetinal Surgery, PA in Minnesota in July for a research elective. Dr Arjmand analyzed outcomes in challenging cases of proliferative vitreoretinopathy (PVR) which is an ongoing active area of study for us. Additionally, she collaborated on developing a novel vitreoretinal surgical technique for optic pit maculopathy. We will keep you posted on the exciting findings from these studies! TASK AT HAND: This week I’m thinking about what it means to jump on the bandwagon. The phrase is from the mid-nineteenth century and attributed to Phones T Barnum who, as a circus owner and showman, would urge audience to jump on the wagon that carried the circus band (a literal bandwagon). 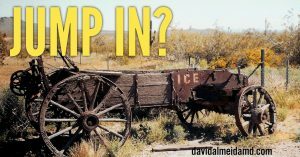 In the modern lexicon, “jumping on the bandwagon” usually refers to individuals supporting a person, team, idea or activity after it is popular or successful. There is nothing wrong with supporting a movement or idea; in fact, you should curate movements that align with your mores, challenge your beliefs, and allow you to develop as a thoughtful creature. My issue with the pursuit of merely popular or successful people or ideas is that they limit your ability for independent thought. To join a collective for the mere sake of popularity, limits choice, and aggrandizes mass effect. There is convenience in joining a bandwagon. 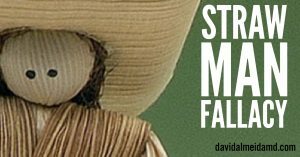 There is instant common ground that, while at times merely superficial, allows connection and fabric to take hold. But, and you know how I fell about convenience – it breeds complacency – and this is where trouble begins. As you become complacent, history shows us with a multitude of examples that it becomes easier to succumb to groupthink and lose objectivity amidst the loud voices of a large group. 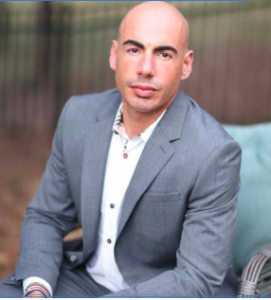 Be wary of bandwagons and, as the existential philosopher Criss Jami so nicely summarizes above, if you must ride a bandwagon, do so with one leg out the cart and be ready to move. Look for a landscape that challenges you as an individual. Realize that autonomous pursuit is lost on the backs of most bandwagons. 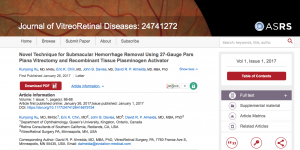 MEDICINE & MACULA: Check out one of our recent publications, Novel Technique for Submacular Hemorrhage Removal Using 27-Gauge Pars Plana Vitrectomy and Recombinant Tissue Plasminogen) Activator (Kunyong Xu MD MHSc, Eric K Chin MD, John B Davies MD & David RP Almeida MD MBA PhD). Many thanks to the Journal of VitreoRetinal Diseases for publishing our work! TASK AT HAND: This week I’m thinking about points of view. Perspective is the context for processing information. Very little – if anything – is black and white. Actions and consequences rarely exist in a vacuum. Instead, there is nuanced context to words in a conversation, lines on a page, and in the decisions we act out. 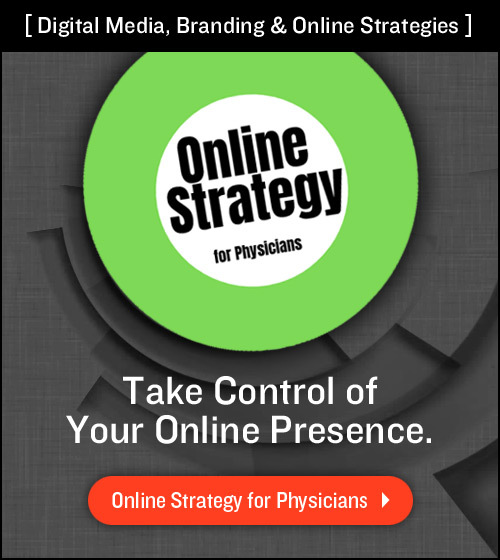 We have previously talked about perspective here on the Sunday Surgical Scrub (March 2017) but, today, we are going to go beyond defining perspective and I will present 3 pearls to points of view that you need to consider for effective strategy. 1) Sensitivity Requires Perspective. Being aware of differing points of views provides sensitivity to the fact that we are all different people, from different cultures and with different mores. Sensitivity, and the ability to detect differences, aligns with one’s ability to be cognizant of diversity. Looking at a situation from the perspective of another, is empathetic and contributes to the fostering of collaborative relationships. 2) Do Not Substitute Perspective for Understanding. There is a strong desire, due to the bias of rationalization, to bend perspective to “fit” with your own thoughts and actions. Avoid this! Look to differing points of view as an empathetic tool but do not distort strategies to fit your unchanging perspective. “A point of view can be a dangerous luxury when substituted for insight and understanding” (Marshall McLuhan). The later quote is essential learning because we must remind ourselves that perspective can both help or hinder our understanding of actions. Cataloging the different points of view relevant to a certain situation are only one component of understanding. 3) Find the Vantage Point. It is possible to, when considering points of view, to ascribe to a perspective that is clear and concise. This is the Vantage Point. Vantage simply means a positon affording a good view. 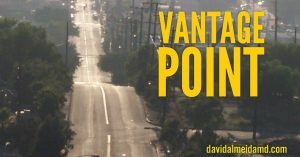 Think of the vantage point as a position of balanced and informative perspective; the point of view uncluttered by bias and most free of rationalization. Try to find the vantage point of a conflict as a means to ascertain the key variables for all the parties involved. Find the vantage point for a decision you are pondering to offer you the needed perspective of consideration and avoid the collusion of bias that is so tricky whenever points of view come into play. MEDICINE & MACULA: Many thanks to Judy Hoberman for having me on the Selling In A Skirt radio show! Judy has incredible insight into the gender differences that we should all understand and embrace instead of feeling unable to communicate about. We discussed entrepreneurship, my book Decision Diagnosis and, of course, gender differences. You can find our July 2017 episode here. 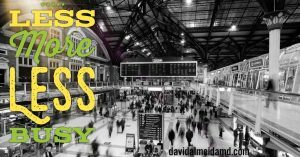 TASK AT HAND: This week I’m thinking about “the busy life”. When I ask friends how they are doing, the most common answer I get – irrespective of whether they work in medicine, business, entertainment or sports – is: “busy!”. How’s the day going? -Busy! How was the weekend? -Busy! How’s the week looking? -Busy! Our language has a powerful effect on how we frame our relationships and strategy. Descriptors, like “busy”, create a disconnect from actions we perform. One is less able to extract meaning from an act that is defined in an impersonal manner such as “busy”. For the descriptor of “busy”, a strategy is simply to finish the event. Unfortunately, this is a rudimentary process because, in the end, what have you achieved? Completed a busy day? Almost always, the tasks have much more meaning that simply of being “busy”. You are living more than just a “busy life”. For example, I see patients and perform surgery. There are days with more patients than others, some days with more complex cases, etc. I have three fantastic kids under 6 years old. Some days are marathons while others are sprints. Some days I enjoy the hectic pace while others I like the pauses for reflection. If I am left describing each of these different days as a homogenous “busy”, there is the deleterious effect of disconnecting me from what it is I am doing during those very different days. Instead, if you re-frame how you look at these “busy” actions, you can open the door to more engagement. The call to action on today’s Sunday Surgical Scrub is to avoid using the word “busy” as a descriptor. Re-frame how you look at your tasks and actions. By simply changing the language you use to describe what you do or how you go about your days, has a demonstrative effect on your level of engagement. This approach allows you greater insight into managing challenges and resolving conflicts. 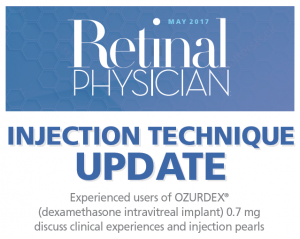 MEDICINE & MACULA: A few months ago, I had the privilege of being on a panel looking at best practices of the surgical technique of the dexamethasone intravitreal implant (Ozurdex). These events always remind me how much I learn from my wonderful colleagues. 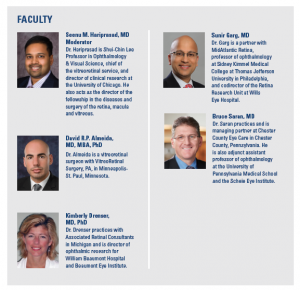 Many thanks to Seenu M. Hariprasad MD, Kimberly Drenser MD PhD, Sunir Garg MD and Bruce Saran MD! For those interested, check out the publication here. GRATIS: Happy Canada Day! Happy Independence Day!